Create a keepsake box for the letters to Santa from the little ones. Remove the hardware from the box. Sand the box. On the lid tape off a rectangle on one side and paint with Black. Using the child’s hand and White, press the handprint into the Black rectangle. 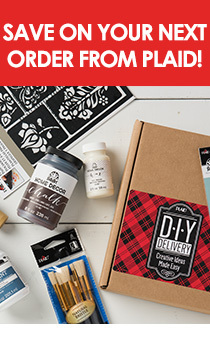 Tape off diagonal stripes on the bottom of the box and paint with Bright Red. Paint a black band around the bottom of the lid and the top of bottom section of the box as shown. Paint the bottom lip of the base Bright Red and the ball feet with Black. Using Bright Red, paint the hat on Santa. When it is dry, use a fingerprint and White to create the trim and pompom on the hat. Sprinkle with glitter while the paint is wet. Use Fleshtone to create the face. Paint the face details as shown. With the foam Spouncer and White, press the scalloped edge around the Santa. With the end of a paintbrush add polka dots in White. Write “Dear Santa…” with Black. Reattach the hardware when the box is completely dry.